“Gaone, is this really what you want?” Silas managed to stutter. How feeble that sounded! And of course it did nothing, absolutely nothing, to make his daughter think twice. She has never been a girl of few words. She definitely hadn’t inherited her father’s flaw. She was talking 10-to-the-dozen now. Off she dashed to her bedroom, with the parcel still under her arm. Silas knew it was time for him to speak up. Even if he was a quiet man, a man of few words, there was no excuse now. His daughter’s future was at stake! Whatever it took, he had to stop her. 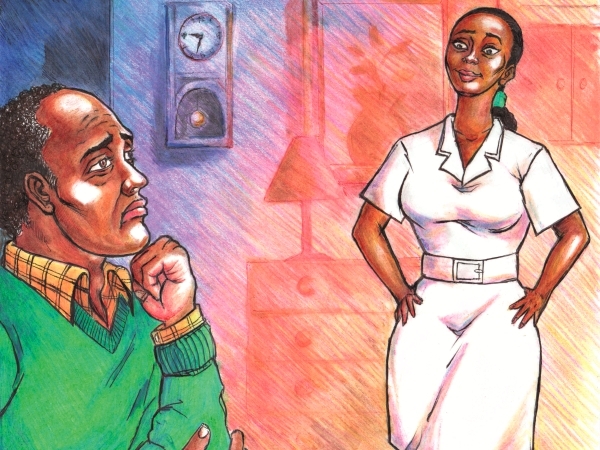 He was still searching for the right words, still trying to work out what Lydia would have said, when Gaone bounced back into the lounge, dressed in a nurse’s uniform. She looked heart-breakingly lovely, her dark eyes shining above the startling white. Eyes that were so like Lydia’s. Silas put his arms around his little girl who was now a grown woman. He forced the words out. Gaone’s hands went back on her hips. “Sick children?” Silas stuttered, feeling confused. Silas eventually had to explain: About the advert, about his panic, about his phone-call to the Black-Eyed Susie Club . . . Gaone shook her head at her father in exasperation. It was something Lydia used to say, too. Gaone ran off to her room and came back with the newspaper advert. She turned it over and laid it on her father’s lap. ON THE other side of the newspaper page, the side that Silas hadn’t noticed, there was a competition entry form, a competition for Father’s Day. The lines below were written in Gaone’s bold handwriting. “Good luck, my darling daughter,” said Silas. And he meant it from the bottom of his heart. He watched her march down to the front gate in her starched white uniform. And then he held the newspaper page against his chest while tears rolled down his cheeks. Tears of joy and pride.